It is the perfect drink before yoga and before any physical activity. These herbs can help with physical, emotional and mental stress. 1. How Can Sunrise Help Me? 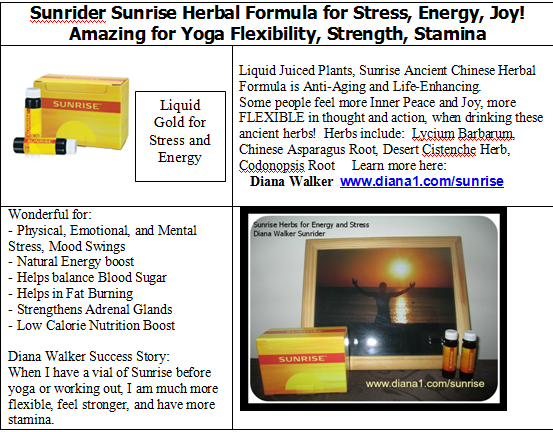 Liquid Juiced Plants, Sunrise Ancient Chinese Herbal Formula is Anti-Aging and Life-Enhancing. Some people feel more Inner Peace and Joy, more FLEXIBLE in thought and action, when drinking these ancient herbs! Herbs include: Lycium Fruit, Chinese Asparagus Root, Desert Cistenche Herb, and Codonopsis Root. 3. What are the Ingredients? Lycium Fruit (Lycium Barbarum) Beneficial for inflammation. Helps liver function. Improves mental well-being and calmness. 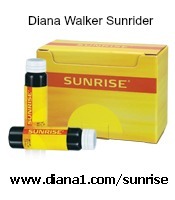 Improved athletic abilities, strengthens legs. Helps eyesight. Boosts immune function. Improves quality of sleep. Promotes longevity. Chinese Asparagus Root (Asparagus Cochinchinensis) helps detoxify the body, cleanses as well as strengthens the heart and kidneys. Desert Cistanche Herb improves brain function (learning and memory) and prevents aging of the brain. Increases oxygen supply to the brain. Preserves brain levels of Dopamine (pleasure hormone). Slows aging process. Fights against stress and fatigue. Cistanche, also known as “Rou Cong Rong” and “Desert Ginseng” has been used in China for more than 1,800 years. The herb has been recorded in the “Shennong Bencao Jing” and the “Nencoa Gangmu” as a tonic. The herb grows in deserts of China and remote deserts of Africa. Codonopsis Root cleanses toxins, especially from the lungs, excellent body tonic. Eucommia Bark strengthens bones and muscles, helpful with lower back and leg pain, stiffness and arthritis. Poria Mushroom supports immune system, calms anxiety, has a calming effect on the digestive system. Helps you feel grounded and calm. 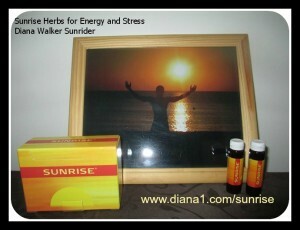 Are you feeling stressed and out of energy? Grab a Vial of “liquid gold” to help you enjoy life again! Diana Walker has helped many people go from feeling stressed and fatigued to being vibrantly healthy, so feel free to contact me and I will be your partner on this health journey.